Magnetic-field detector; silicon-based nanoneedles; tobacco cell-nanotube thermometer. In a development that could lead to miniaturized, battery-powered devices for medical and materials imaging, contraband detection, and even geological exploration, MIT researchers have developed a new, ultrasensitive magnetic-field detector they say is 1,000 times more energy-efficient than its predecessors. Magnetic-field detectors, or magnetometers, are already used for all those applications but the team explained that some existing technologies rely on gas-filled chambers while others work only in narrow frequency bands — all of which limits their utility. 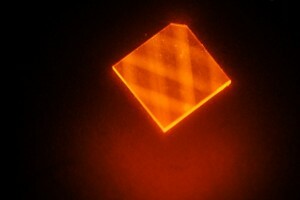 Synthetic diamonds with nitrogen vacancies (NVs) — defects that are extremely sensitive to magnetic fields — have been known to be a promising solution here, how with each diamond chip potentially containing trillions of nitrogen vacancies, each capable of performing its own magnetic-field measurement but aggregating all those measurements has been a problem. Probing a nitrogen vacancy requires zapping it with laser light, which it absorbs and re-emits. The intensity of the emitted light carries information about the vacancy’s magnetic state. In this image, laser light enters a synthetic diamond from a facet at its corner and bounces around inside the diamond until its energy is exhausted. This excites “nitrogen vacancies” that can be used to measure magnetic fields. In the past, only a small fraction of the pump light was used to excite a small fraction of the NVs, and almost all the pump light is used to measure almost all of the NVs. Researchers from Imperial College London and Houston Methodist Research Institute have leveraged nanotechnology to create tiny nanoneedles that have successfully prompted parts of the body to generate new blood vessels, in a trial in mice and could ultimately help damaged organs and nerves to repair themselves and help transplanted organs to thrive. The nanoneedles work by delivering nucleic acids to a specific area. Nucleic acids are the building blocks of all living organisms and they encode, transmit and express genetic information. Scientists are currently investigating ways of using nucleic acids to re-program cells to carry out different functions. 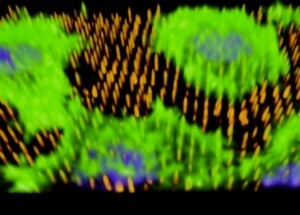 The image (above) shows human cells (green) on the nanoneedles (orange). The nanoneedles have injected DNA into the cells’ nuclei (Blue). The image was taken by the researchers using optical microscopy. The nanoneedles are tiny porous structures that act as a sponge to load significantly more nucleic acids than solid structures. This makes them more effective at delivering their payload. They can penetrate the cell, bypassing its outer membrane, to deliver nucleic acids without harming or killing the cell. The nanoneedles are made from biodegradable silicon, meaning that they can be left in the body without leaving a toxic residue behind. The silicon degrades in about two days, leaving behind only a negligible amount of a harmless substance called orthosilicic acid, the researchers noted. ETH Zurich scientists have developed a thermometer they report is at least 100 times more sensitive than previous temperature sensors, and made of a bio-synthetic hybrid material of tobacco cells and nanotubes. Humans have been inspired by nature since the beginning of time. We mimic nature to develop new technologies, with examples ranging from machinery to pharmaceuticals to new materials. Planes are modelled on birds and many drugs have their origins in plants. Researchers at ETH Zurich’s Department of Mechanical and Process Engineering have taken put their inspiration from nature to good use: in order to develop an extremely sensitive temperature sensor they took a close look at temperature-sensitive plants. Interestingly, instead of imitating the properties of the plants, they developed a hybrid material that contains, in addition to synthetic components, the plant cells themselves — letting nature do the job for them. 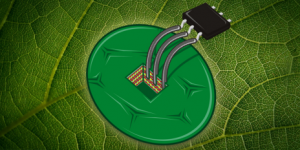 As a result, they were able to develop the most sensitive temperature sensor: an electronic module that changes its conductivity as a function of temperature. They stressed that no other sensor can respond to such small temperature fluctuations with such large changes in conductivity — this sensor reacts with a responsivity at least 100 times higher compared to the best existing sensors.